DAN CRARY and THUNDERATION is Dan’s newest sound fusion ensemble, and the amazing music just keeps flowing. This time Dan has partnered with long time friend and musical comrade, singer/songwriter Steve Spurgin, as well as power hitters Don Stiernberg (mandolin), John Reischman (mandolin), and Keith Little (banjo, mandolin). Also adding sparkle and creativity are the up and coming Luke Dewhirst (banjo) and Martin Stevens (fiddle). The approach is fresh, yet remains fully grounded in American roots music. 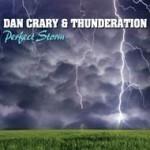 “PERFECT STORM” is simply Dan Crary at his best.